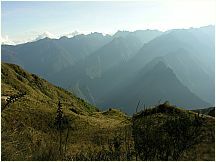 48 Free photos of Inca Trail, Peru. 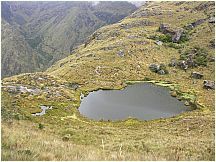 These free photos (below text) are of the Classic Trail (four-day trek). 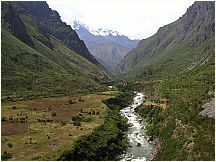 The four-day trail started at km 82, on the Urubamba River, from Ollantaytambo. 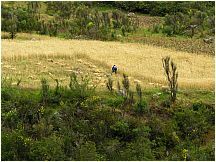 The first day is relatively easy, covering no more than 13 km in a few hours, passing by the Inca ruins of Llaqtapata, a site used for crop production and which has remained well preserved. 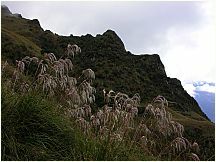 Day two includes the ascent to Warmiwañusca or Dead Woman's Pass, (or Sleeping Woman's Pass) which, at 4,215 m above sea level, is the highest point on the trail. 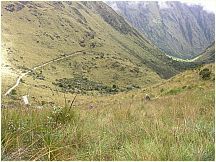 Day three starts with the final climb to Dead Woman's Pass, although some groups climb to the top of the pass on the second day and camp 600m below it on the other side at Pacaymayu. 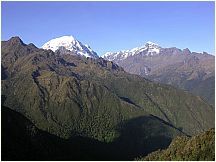 The views from the top provide excellent views of nearby mountains such as Salkantay and Veronika. 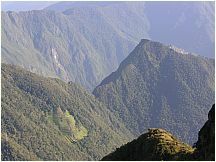 After a second pass is the site of Sayaqmarka, perched atop a sheer cliff. 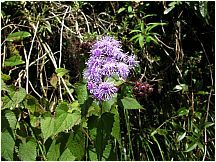 After Sayaqmarka the Trail continues through thick cloud forest and jungle, filled with tropical flowers and colourful orchids. 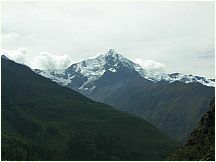 The third and final pass is Phuyupatmarka. 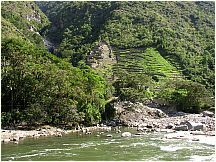 The final day sees a descent past Winay Wayna, an impressive and well-preserved Inca site, where the one-day trail meets up with the main route. 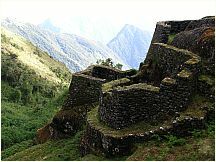 Among the many roads and trails constructed in pre-Columbian South America, the Inca road system (El Camino Inca) of Peru was the most extensive. 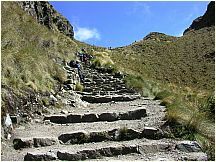 Traversing the Andes mountains and reaching heights of over 5,000 m (16,500 feet) above sea level, the trails connected the regions of the Inca empire from the northern provincial capital in Quito, Ecuador past the modern city of Santiago, Chile in the south. 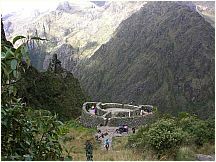 The Inca road system covered approximately 22,500 km (14,000 mi) and provided access to over three million km² of territory. 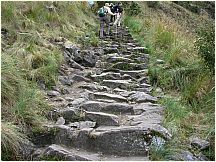 The Incas did not have wheels, and did not have horses until the arrival of the Spanish in Peru in the 16th century, so the trails were used almost exclusively by people walking, sometimes accompanied by pack animals, usually the llama. 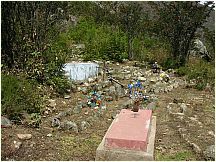 The trails were used as a means of relaying messages, carried via knotted-cord quipu and by memory; and for transporting goods. 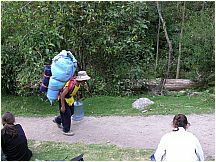 Messages could be carried by chasqui runners covering as much as 240 km (150 mi) per day, working in relay fashion much like the Pony Express of the 1860s in North America. 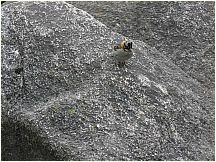 The unheralded part of this is that much of this was on steps that are often slippery and wet. 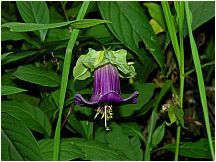 There were approximately 2,000 inns, or tambos, placed at even intervals along the trails. 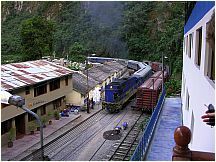 The inns provided food, shelter and military supplies to the tens of thousands who traveled the roads. 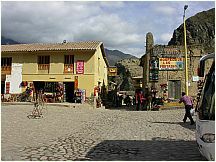 There were corrals for llamas and stored provisions such as corn, lima beans, dried potatoes, and llama jerky. 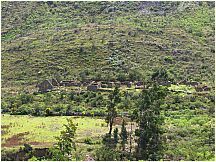 Along the roads, local villagers would plant fruit trees that were watered by irrigation ditches. 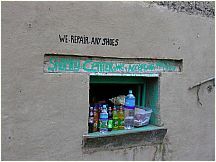 This enabled chasqui runners and other travelers to be refreshed while on their journeys. 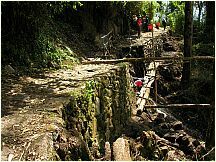 Inca rope bridges provided access across valleys. 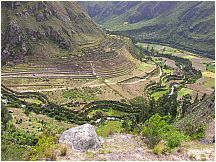 Many of the trails converge on the center of the empire, the Inca capital city of Cusco. 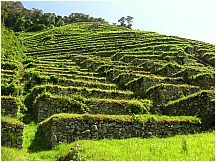 Therefore, it was easy for the Spanish conquistadors to locate the city. 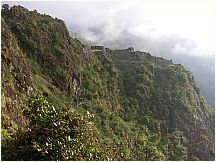 Traversing the trails on horseback proved to be difficult and treacherous for the Spanish in their attempts to conquer the Inca Empire. 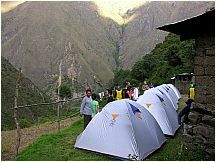 By far the most popular of the Inca trails for trekking is the Capaq Nan trail, which leads from the village of Ollantaytambo to Machu Picchu, the so-called "Lost City of the Incas". 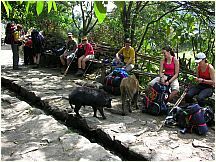 There are many well-preserved ruins along the way, and hundreds of thousands of tourists from around the world make the three- or four-day trek each year, accompanied by guides. 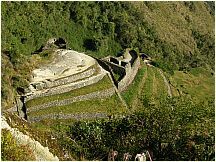 The Inca Trail to Machu Picchu is actually three routes, which all meet up near Inti-Pata, the 'Sun Gate' and entrance to Machu Picchu. 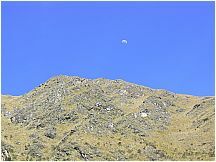 The three trails are known as the Mollepata, Classic and One Day trails, with Mollepata being the longest of the three. 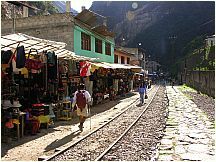 Passing through the Andes mountain range and sections of the Amazon rainforest, the Trail passes several well-preserved Inca ruins and settlements before ending at the Sun Gate on Machu Picchu mountain. 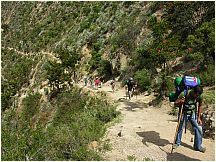 The two longer routes require an ascent to beyond 12,000 ft (3,660 m) above sea level, which can result in altitude sickness. 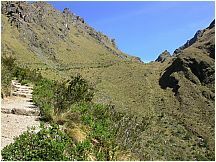 Concern about overuse leading to erosion has led the Peruvian government to place a limit on the number of people who may hike this trail per season, and to sharply limit the companies that can provide guides. 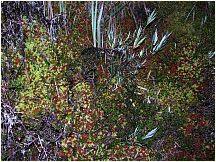 As a result, advance booking is mandatory. 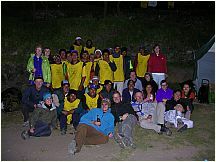 A maximum of 500 people, including guides and porters, are permitted to begin the trail every day. 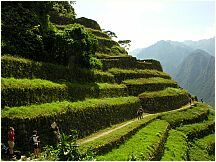 As a result, the high season books out very quickly. 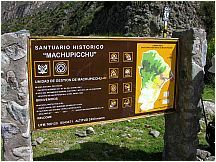 Map at the entrance to the MachuPicchu historic sanctuary, which contains the park. 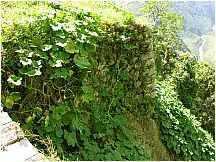 Inca city ruins along the Urabamba River. 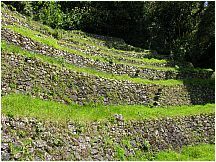 Note the lower terraces in the shape of a serpent, an important Inca god. 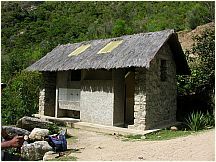 A typical toilet along the Inca Trail. 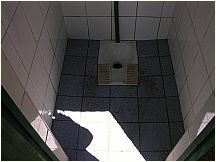 No seats, just squatting, of the style in much of Russia and East Asia.